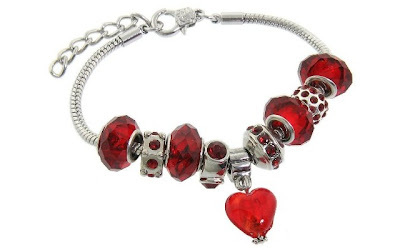 This Murano-Style Glass Beads and Charm Bracelet, 7.5+1" Extender (available in Red, Blue, Clear, Green, and Turquoise) is currently selling for just $19.00 on Amazon.com! You will be saving 72% off the listed price of $68.25 with this jewelry deal. What I like about this bracelet is the variety of birthstone-like colors. It would make a nice birthday gift and the red would be particularly perfect for a Valentine's Day gift.